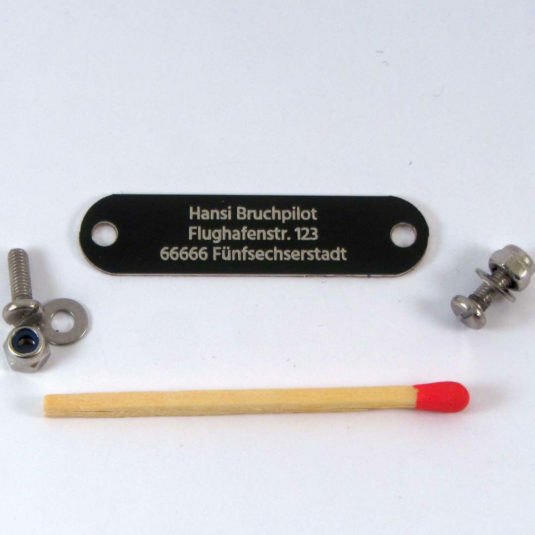 In Germany, radio controlled planes and drones need an address label by the owner if the weight of the model exceeds 250 g. Self-adhesive name plates made from thin aluminum sheets are a perfect choice for this. After selling these plates for almost one year in Germany my shop is open now for international orders. The parts are small and lightweight, therefore I have to ask only for a small amount of additional costs for shipping to various countries. As all descriptions in my shop are available in German language only I’d like to give some general explanations in English here. 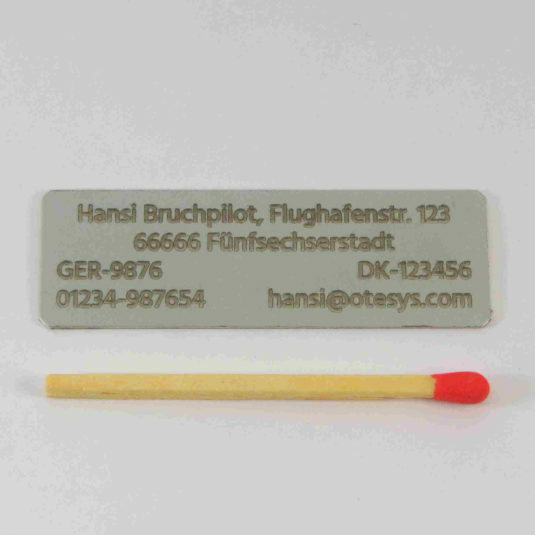 Extra thin name plates can be bended by hand to snug fit to curved (not spherical) surfaces on fuselages. What to put on the address label? While German law requires the plate showing the address of the owner only it makes perfect sense to present additional information like phone number or email address. Because in case you lose your model, this enables the honest finder contacting you more easily. Who would write a post card? For most countries it will be necessary having four lines on the address label. Therefore to show more information than just the address, my special four line name plates allow a maximum of 12 entries. How does that work? Each line can have three entries: Left-aligned, centered and right-aligned. This gives you a maximum of flexibility. Note: If a field is not used, enter a blank there so I know it is intentional left out. For that reason the shop software will force all fields have at least a blank entered. Press the back button in your browser if an error message comes up and fill the enumerated fields. If three lines are enough, there are more simple versions with three centered entries. Or again a sophisticated version with three entries per line allowing a total of 9 entries. This version has a nice handwriting font in the first line, and the text is a little bigger there. Again, all fields must be entered for this version, at least with a blank. The black plates have white or light gray letters. This gives best contrast and readability. They are available in two sizes (50 mm x 16 mm or 32 mm x 10 mm). You can select from 0.5 mm (0.02”) or 0.13 mm (0.005”) aluminum material. The adhesive on the back adds a little thickness, therefore the thin version of the plates will protrude three tenth of a millimeter only, rather less. These plates are very thin and will add only a fraction of a gram to your model. Besides the low weight the thin version (labeled “extra dünn” in my shop) has one further more advantage: You can easily form the plate by hand and make it snug perfectly on the fuselage – even if the surface is curved (but not spherical). Form the plate to match the contour before you remove the protective film on the back. This ensures the adhesive is not under tension later. 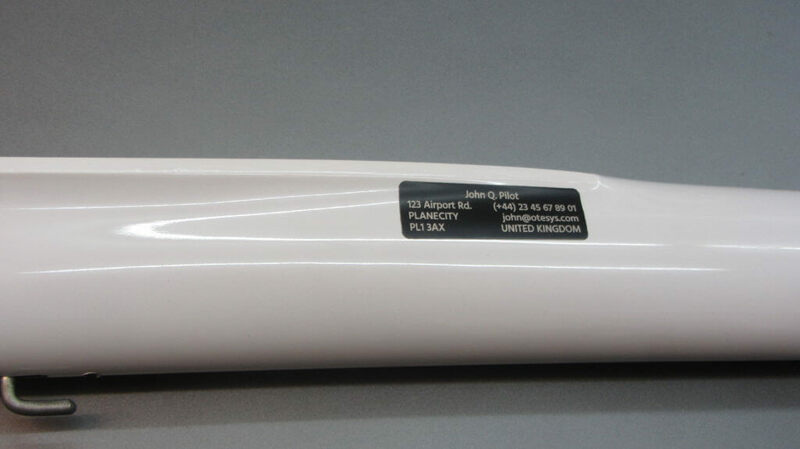 Extra thin 50×16 address label applied on an F3J fuselage. 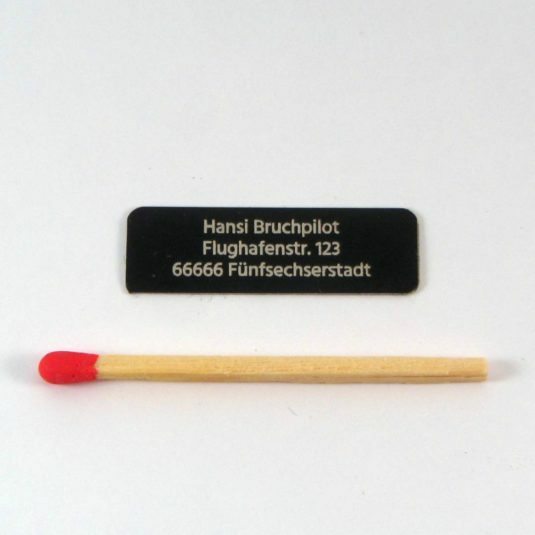 Many pilots prefer a non-prominent position. 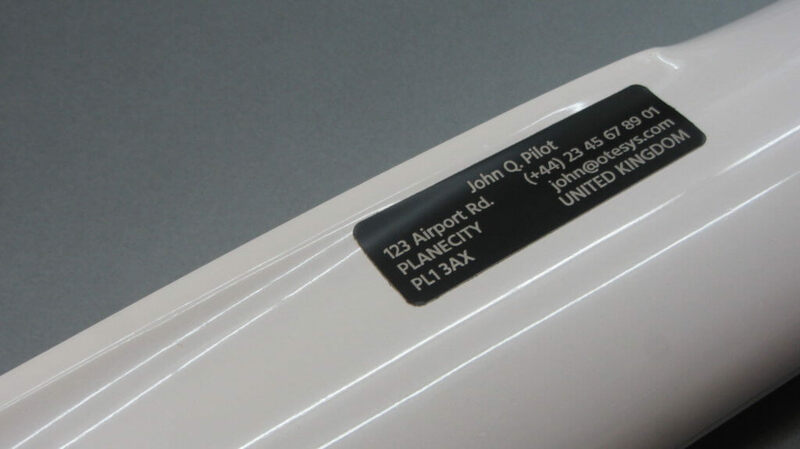 The picture is showing John’s address label on an F3J fuselage below the wing. Extra thin name plates can be bended by hand to snug fit to the curved surfaces you find in these areas. 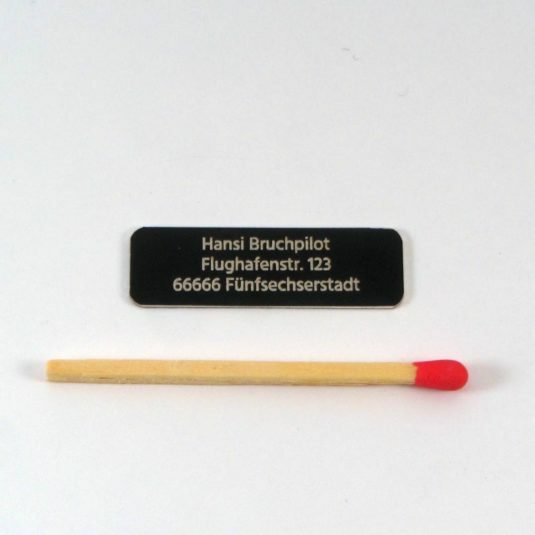 You will find bundles, collective orders “3-Freunde-Set” and family discounts if you explore my shop more deeply (and take the language hurdle…). What will fit on the plate? The shop software will not check whether the text fits on the plate or if something overlaps on plates with three columns. I’ll check that prior to manufacturing and contact you if something needs to be corrected. For the plates with four lines and three columns there is a test file in the download section: Download the file. You are welcome to contact me via email if more questions come up.